Stephen Brennan was sent to the island for bushranging. He was tried there and found guilty of the murder of another convict. There had been no quarrel between the two men, who were as friendly as circumstances permitted under the rigid discipline, nevertheless Brennan suddenly struck Patrick Lynch a blow with a stone-breaker’s hammer, and then stabbed him with a knife. The murder was committed avowedly so that the perpetrator might be hung, and thus escape the harsh treatment he was subjected to, and it is not improbable that it was committed with the consent of the victim, for although there is no evidence of this in this case, it is well known that men had actually drawn lots in Norfolk Island, to decide which should murder the other and get hung for the crime. This is a very compelling parable, but as a factual matter we’re not sure the basis of the word “avowedly” here; be that mutual lot-drawing trend as it may, the reporting accessible from the National Library of Australia archives suggests that Brennan mounted a vigorous defense, and continued to claim to the foot of the gallows that the homicide was strictly self-defense. Incidents of “suicide by hangman” had been known among the prison population under the island’s rigorous recent commandant, Joseph Anderson. 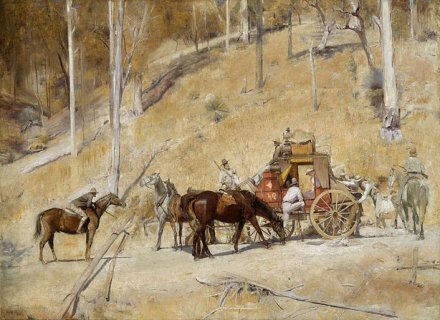 The romance of the road, the temporary autonomous zone — in Australia, the characteristic form of the social bandit is the bushranger. Bushrangers, Victoria, Australia, 1852 by William Strutt. Escaped convicts or other outlaws who could live rough on the remote frontiers of British imperial authority, rangers of the bush whether as gentleman outlaws or merely as robbers embodied the personal freedom so antithetical to the great penal colonies. Not uncommonly, they married that persona to a trenchant critique of the prisons state they escaped. The prisoners of all classes in Government are fed with the coarsest food; governed with the most rigid discipline; subjected to the stern, and frequently capricious and tyrannical will of an overseer; for the slightest offence (sometimes for none at all the victim of false accusation) brought before a magistrate, whom the Government has armed with the tremendous powers of a summary jurisdiction, and either flogged, or sentenced to solitary confinement, or retransported to an iron gang, where he must work in heavy irons, or to a penal settlement, where he will be ruled with a rod of iron. While they filled up the hangman’s docket in the 19th century and they weren’t all picturesque political refuseniks, Bushrangers by and large enjoy a positive posthumous image, celebratory songs and everything. For the next three days, we’ll meet a few of them … culminating in the most famous bushranger of all.